Hello. Like so many within the shooting community, I find myself afflicted with "galloping gunorrhea", a condition in which resistance to buying certain firearms fades to nothing and one's backbone becomes mush. The ability to utter even a faint, "No", becomes almost impossible...especially if the price is right. The disease's symptoms are similar but it is triggered by different firearms, depending upon the shooter. For some, it might be brought on by certain Garands for sale, or FAL's, side x side shotguns or a myriad of handguns. For me, intense flare-ups occur when I see certain specific handguns such as 9mm FN/Browning Hi Powers, certain 1911-pattern pistols and many pre-lock S&W revolvers. I am as fond of the S&W Model 10/64 family of K-frame .38 Specials as I am Hi Power pistols. 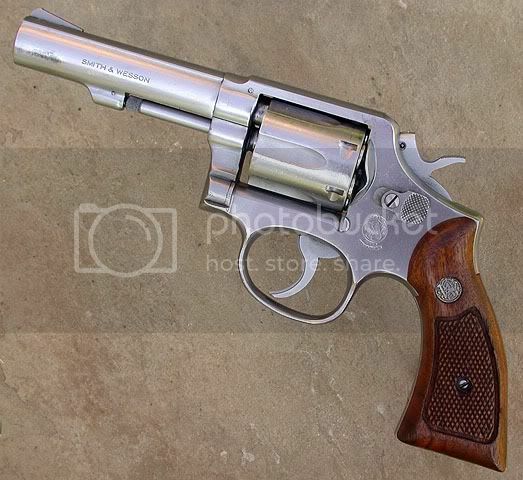 My most recent attack of galloping gunorrhea resulted in my buying a very clean S&W Model 64-3 with a 4" heavy barrel. 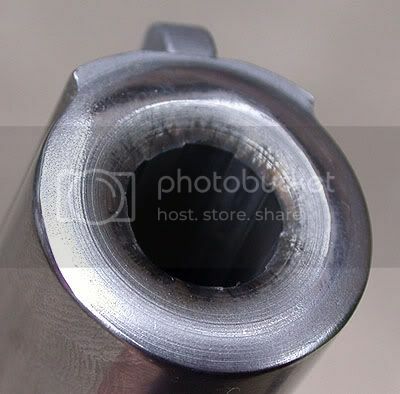 It had been carried a little and had a few shiny "rub marks" on the barrel and cylinder from rubbing against a holster. The right-side service grip panel showed a few dings, but not bad; the set can be cleaned up and refinished. The left-side panel was fine. This is typical of a handgun carried on a person's right side. The seller advised that the serial number indicated 1981 manufacture. Here is the Model 64 as I bought it. The double-action was quite smooth and measured 12.5-lbs. 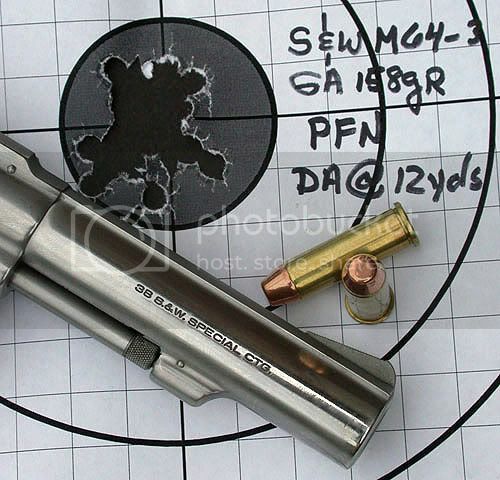 Single-action dropped the hammer at S&W's usually crisp 4-lbs with practically no over-travel. Side plate screws didn't appear to have been removed or at least had been removed with a proper screwdriver...if at all. The bore was pristine and no nicks or flaws were visible at the barrel crown. Both cylinder lock-up and timing were fine whether the trigger was pressed slowly or not. I have removed the magnas and will refinish them in the near future. In the meantime, I stuck a set of Pachmayr "Grippers" on the revolver. I also "cleaned up" the extremely minor surface flaws using Flitz and cleaning patches. Here is the revolver in its current condition and as it was for today's short range session. I didn't have a lot of time today so I only shot a couple of loads through the gun, both being commercial reloads from Georgia Arms. The first load was their lightly-loaded 125-gr. LFP "Cowboy" load and the second was a 158-gr. PSWC ("Plated Semiwadcutter") that in reality is a plated flat point. I will wring the gun out more in later sessions but despite my lack of time today, I fear it is at least a minor sin not to fire a new acquisition, particularly a favorite even if it has rained for days and you've been busy with other projects. All shooting today was done double-action and using a two-hand hold in a standing position. Distance was only 12 yards. There was no effort at speed. I just wanted to see if the revolver was functioning properly and check POA vs. POI. I don't recall how many cylinders-full either load were fired at their respective targets. For this light load, POA was the center of the bullseye. I estimate that a total of about 150 shots were fired total through the gun today but not all at the targets shown in this post. 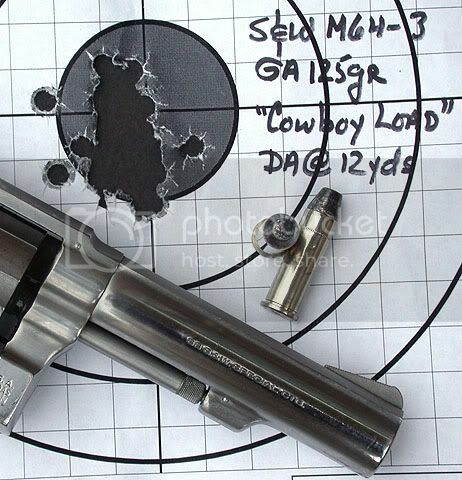 Not quite a six-o'clock hold, I aimed slightly below the center of the bull when shooting the standard power 158-gr. plated bullet load. Around the crown, fouling appeared uniform and no obvious flaws or nicks were observed. In short, I was not surprised with either the 100% reliability or the gun's ability to group. POA is matching up nicely to POI, at least at this distance and based on past experience, will be fine at about any "normal" handgun distance. Though a couple of more shooting sessions will be required to be absolutely sure, I strongly believe that this revolver will be a boringly reliable, tight-grouping K-frame .38 Special but in these cases, boring can be good. The gun looks great with both sets of grips. 1. Are J-frames the smaller ones that may/may not be the 2" snubbies? 2. Are K-frames always the larger ones as you have shown in this post? 3. Tell us a little about the "lock". I have picked up that most folks don't like lock models. 4. Was there a particular year when S & W went to "locks"? 5. Do all S & W revolvers now have locks? 6. Can S & W revolvers handle +P loads due to heavier construction than some cheaper revolvers? Thanks for the nice review of your new piece. 1. Are J-frames the smaller ones that may/may not be the 2" snubbies? Yes, they are the small-frame S&W's. Normally, they are seen with snub 1 7/8" bbl's but other lengths are available as well. 2. Are K-frames always the larger ones as you have shown in this post? The K-frame is S&W's "medium" frame and it is larger than the J-frame. It is smaller than the L, N and certainly the latest X-frame S&W revolvers. The revolver shown in this post is the K-frame size. 3. Tell us a little about the "lock". I have picked up that most folks don't like lock models. Some do, many don't and some don't care. The idea is that the gun can be rendered safe by locking it when it is being stored or not used. I do not care for them for a couple of non-political reasons, the first being that I have personally seen two new S&W lock-equipped snubs "self-lock" when being fired. One was a .38 Special M642 and the other was one of the Airlight line of .357 snubs; I really don't remember the model number on that one. I am told that this just doesn't happen but I have seen it occur twice on separate days. It does or did happen. I have also seen many, many, many of the lock-equipped S&W's work perfectly. The second reason I detest the locks is due to the contour change it caused on models with external hammers. Some will disagree and that's fine. 4. Was there a particular year when S & W went to "locks"? I THINK it was 2001or in that general time-frame but I could sure be wrong; I quit buying NIB S&W's when the lock came out but don't recall the exact year. I am hoping someone here will have it for you. They came about due to a deal made with the Klinton Administration when gunmakers were under assault from costly lawsuits. 5. Do all S & W revolvers now have locks? I don't think that the steel-frame Centennial (Model 40, I think) has one. It does have a grip safety on the rear and there has been a run or two of Model 642's and 37's w/o the lock. Most will have it, though. 6. Can S & W revolvers handle +P loads due to heavier construction than some cheaper revolvers? 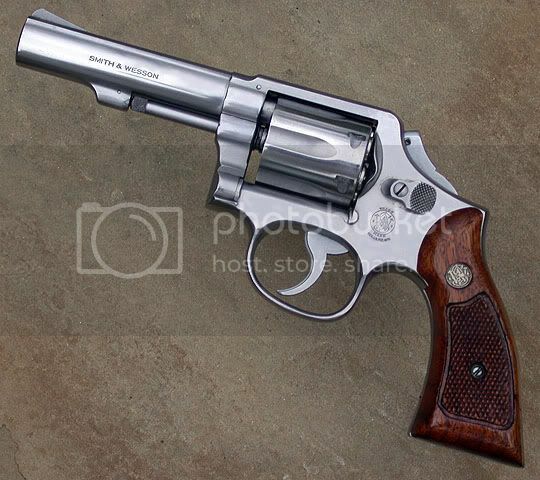 If it has a steel frame, S&W says that any of their revolvers that are designated with a model NUMBER can handle +P. They have desiginated +P on the barrels of their aluminum-framed snubs that are rated for it. Thanks for the S & W tutorial. Stephen, is it possible to render the locks inoperable without harming the pistol's action? I have a 642 with lock. Since I'm not familiar with handling/shooting one without the lock, I don't know that it makes a bit of difference to me as far as how the pistol feels in the hand, or how well or badly it shoots. But I am concerned about the possibility of self-locking, since you brought it up (it hadn't occurred to me before that). One of the reasons I love the little pistol is for its reliability, and you have just shaken my confidence in that. My 642 is my go-to gun when carrying one of my other pistols doesn't work for me, and it would be a bad-hair-day to say the least if it ever decommissioned itself right when I needed it most. My wife has one too, which she carries much more frequently than she carries her Glock 19, and I hate the thought of what could happen to her too in such a scenario. Hello. Yes, they can be disabled and even removed with a substitute plug to fill the hole in the frame. You can find the other on that site with a search if interested. Please let's NOT use this post to start a liability debate or storage lock vs. no storage lock debate. There are plenty of those on many sites and most degrade into shouting matches similar to the "caliber wars". In this section of this site, let's not do it. Thanks in advance and best. Stephen A. Camp wrote: Hello. Yes, they can be disabled and even removed with a substitute plug to fill the hole in the frame. Thanks for the link, Stephen. And by no means am I interested in the debate. All I care about is reliability for this pistol. I polished out few more very minor minor surface flaws and have cleaned up and refinished the magna stocks that came with the gun. A quick review in Kuhnhausen's The S&W Revolver (A Shop Manual) and I fitted the sear on this spurless DAO hammer to the gun. A small amount of very fine and minimal polishing internally and a 16-lb rebound spring have made an already slick action a little nicer, but I am by no means capable of real action work. I just did a tiny bit of "cleaning"and "smoothing" here and there. I fired a couple of hundred rounds without incident yesterday but will need to do this again at least once more before I will actually trust this revolver enough to use it for anything potentially "serious". I'll probably load up a couple of hundred .38 handloads using CCI primers and if it they all "pop" flawlessly, I'll likely consider it good to go. I already know that the sights are "on" with my carry load of choice as well as the handloaded 158-gr. CSWC's I shoot fairly frequently. Model 10's and 64's are sort of like Hi Powers to me; I cannot resist them.